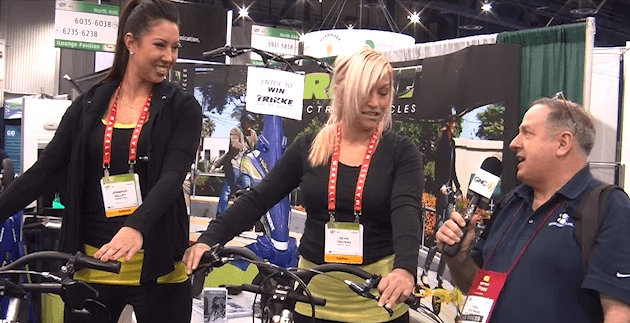 If you live in the city or suburbs and are looking for a vehicle that you could ride to work and have fun doing it, then you may want to take a look at the Trikke. As the word indicates the Trikke is a three-wheeled electric vehicle. Because it has three wheels it is very stable and easy to ride. You simply turn the throttle and go. You can lean into the curves and the wheels never leave the ground. It folds up so you can easily fit it in the back of a car or carry it into the office. A Trikke weights between 35 and 48 pounds (with battery) depending on the model, so you are probably not going to want to carry it far. You can plug it into any outlet to recharge it. A battery takes about three hours to fully recharge. On a fully charged battery a Trikke will go from 10 to 24 miles depending on model and weight of the rider. You can reach speeds up to 17 miles per hour. Trikkes are available in different colors and models and the prices range from $1300 to $2200 depending on the model. If you are a skier a Trikke would be a great way to keep in shape for the skiing season. You use the same muscle and movements on a Trikke that you do for skiing and it is low impact. Easier to ride than a bike and a lot better on the bottom.